For those of your with broadband, you can watch the whole thing in this three-minute video. For the low-bandwidth version, see below. You know that I enjoy baking. You know that I’m still on a quest to create a really good loaf of whole wheat bread, a loaf like the ones I bought at Whole Foods back when I lived in the US. And I hope you know that these continual mishaps and disappointments are real, not just staged for your entertainment. After my last attempt, I felt I had at least arrived at a recipe that had good flavor and good self-rising capabilities thanks to the sourdough starter I’ve been nuturing. The problem was, the loaf wasn’t big enough to fill the pan. This time I increased the recipe by 50%, approximately how much more bread I needed in the pan to get a loaf big enough for sandwiches. Somewhere after the first rise I got distracted and decided to bake the bread in my French loaf pan. 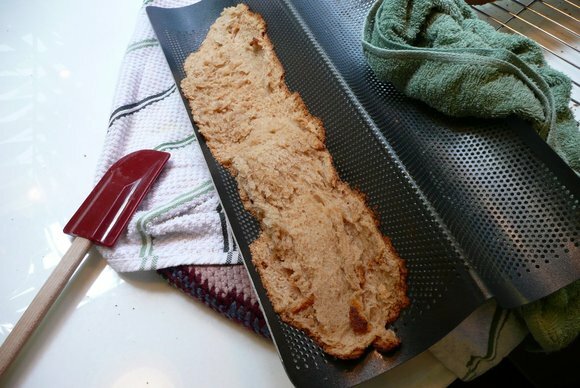 I don’t know why I didn’t stick with my normal rectangular loaf pan. Changing pans meant that I wouldn’t be able to compare the volume of the new loaf to the old one. But some whim captured my fancy and the French loaf pan seemed like a brilliant idea. At first, it seemed like a success. After the second rise, I had a beautifully shaped loaf that looked a lot like a real French batard. I was even able to score the surface without any tearing or deflating. Fifteen minutes later the aroma of fresh-baked bread began to fill the house. Oh, I just knew I was on the path to success! 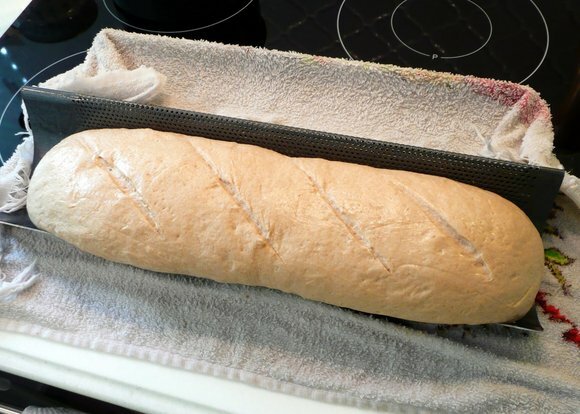 When it came time to pull the loaf out of the oven, it was a little dark on the outside – note to self: lower temperature next time – but the internal temperature indicated that it was cooked through. The problem came when I tried to remove the loaf from the pan. The pan, which has a thousand or so tiny perforations to allow the crust to crisp on all sides, was supposedly non-stick. 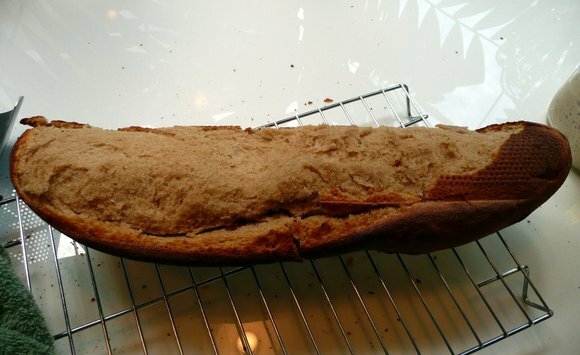 In fact, a previous loaf I baked in it had pulled away with no problem. But this time the dough had risen into hundreds of those holes, expanding as the loaf baked and essentially gripping the pan like hundreds of little fingers. I couldn’t remove the loaf! I tried using a silicone spatula to slip between the crust and the pan. No success. Ultimately, 80% of the loaf came away while 20% stayed with the pan. The upshot was that despite its hideous exterior, like Victor Hugo’s Hunchback, the loaf contained a complex, delicate, and rich interior that was worth knowing. Especially with butter and preserves. The downside was that I had to “stew” the pan for several hours over low heat, basting it with water, in order to loosen the lower crust. Even then, I still had to take a toothpick and clean out each of those hundreds of holes, one by one. Next time, despite the claims of non-stickiness, I’m using parchment paper. I have many, many kitchen disasters. I wonder how long it took to clean that pan? baking bread is tough! my bread comes out rock hard. Wonder how “Subway” sandwich do their baking….I notice your kitchen is super clean!! Nice!! awww! thats so sad. Yeah parchment paper would be good to line the bottom. Good to know. I just got one of those preforated pans. I am ALWAYS a disaster in the kitchen! lol But the bread did look good before it was mutilated! “That’s burned bread!” said Emily. Hang in there. I always say that as long as it tastes good, it is worth it. I am also, however, the person who goes berserk when something can not be perfectly cleaned to my satisfaction, so I feel for you! Doh! It was all going so well! It sounds like you have the recipe down as far as taste. I agree that parchment paper will probably work well, along with turning down the heat a little bit. 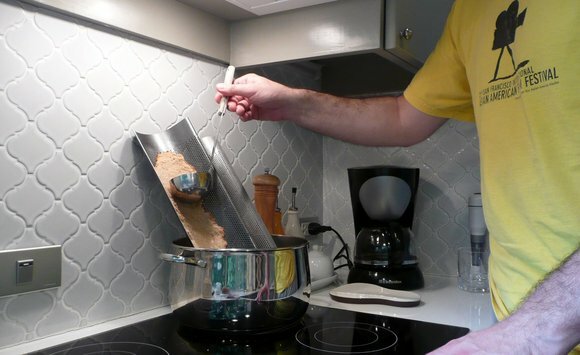 Have you thought about trying one of those flexible silicone pans? I think it’s what they use at Subway. You’ve almost inspired me to make my on starter… almost. Oh dear. Poor bread and poor you. 😦 One thing that I learned in baking school is to ALWAYS grease the pan even if it says non-stick. And thanks for the video. It was cool seeing it all play out. Chris.. would suggest lining the pan with Parchment paper. Shouldn’t have any issues with sticking. 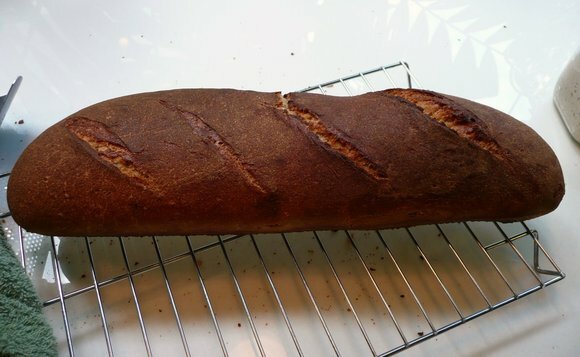 I have done some bread before and have had good success with parchment. Also you will not have to clean the pan!. Even better! @alextebow – I had one of those silipat mats for baking and always felt like it was a little “sticky” after cleaning. Towel lint would cling to it, for example. It made me feel like it wasn’t really clean, so I stopped using it. Maybe the silicone pans are different than the silicone mat, but even at the store the dust seems to stick to them. Plus, the point with the perforated pan is that it allows more even crisping of the crust.